Last year, pro-climbers Alex Honnold and Cedar Wright switched gears, embarking on their first bike tour, “The Sufferfest.” Along the way, they would summit all 15 of California’s 14,000 ft peaks, free-soloing any technical routes they encountered. 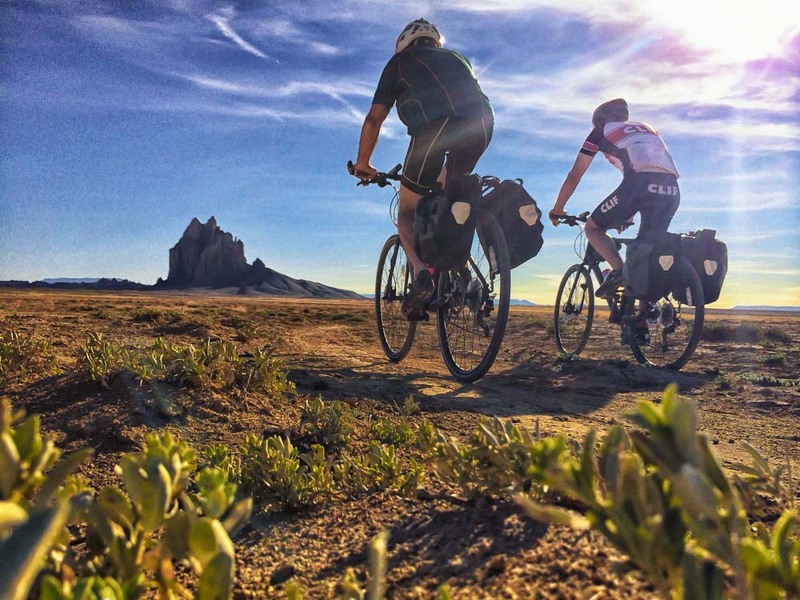 This year, they hopped back on their bikes for Sufferfest 2, a fantastic three-week tour of the Southwest. The duo felt the need to raise the stakes; they hoped to free-climb 45 select towers along the 800-mile journey. If that sounds like a lot for 21 days, that’s because it is. Especially when you consider all of the variables; 33 of the 45 of the climbs were graded at 5.11 or above. Cycling could be the ideal mode of transportation for a dirtbag adventure. Walking is a little pedestrian, and driving shields you from the world around you. Bike touring is a great way to travel through some undeveloped areas of the world. It affords you the time to experience your surrounding with all of your senses, creating a daily routine of mental and physical challenges to make each day interesting. When you add a strenuous climbing regime and strict timelines, things get insane. Granted Alex and Cedar weren’t averaging huge days on the bike (~33 miles per day), but sitting on a saddle after climbing hard all day can’t be considered easy. Recently, we had a chance to meet the two athletes during the NYC premier of their new film for the North Face Speaker Series. There was a one-hour meet and greet before the show, and a Q&A session afterwards. It was clear that their perception of risk and their ability to push mental and physical boundaries is so vastly different from most people they meet. All of this was amidst the recent decision of Clif Bar to drop its sponsorship for Alex and Cedar because of the risks they are taking free-soloing. Clif also dropped three other athletes who are base jumping or high lining. The timing is a bit odd as Alex and Cedar are out on the road promoting their new CLIF-sponsored film. To add to the irony —the film shows Cedar and Alex working through unstable rock conditions on the Northeast Arete of Sharks Fin, a 5.12 R/X — arguably much more dangerous than free-soloing a practiced route. Scenes from the film are stunning, from the climbing action shots to the sweeping desert views. Goofball moments highlight the undeniable friendship that exists between Cedar and Alex through their harrowing adventures. Throughout Sufferfest 2, they encountered terrible weather, unforgiving rock quality, and their fair share of bumpy off-road cycling. 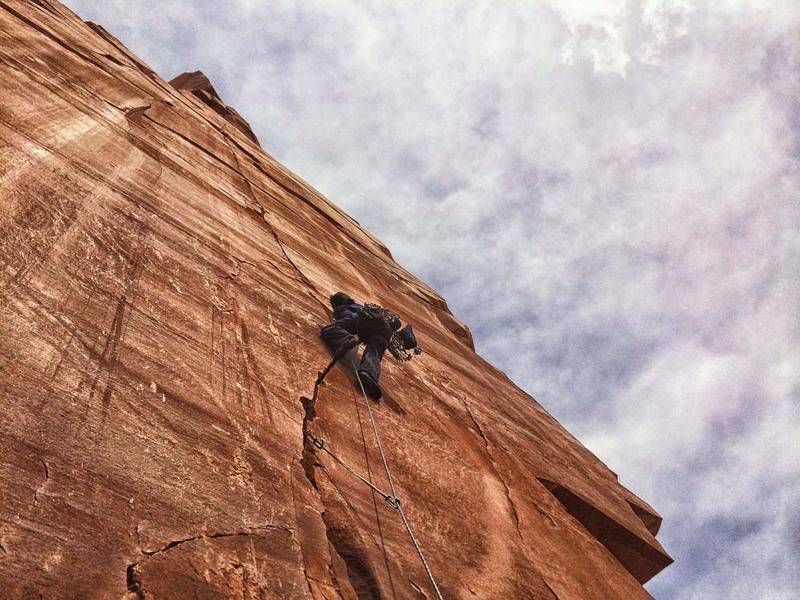 Seven of the routes climbed are within the Navajo Nation, a place seldom climbed as the reservation has a strict ban on climbing in tribal areas. 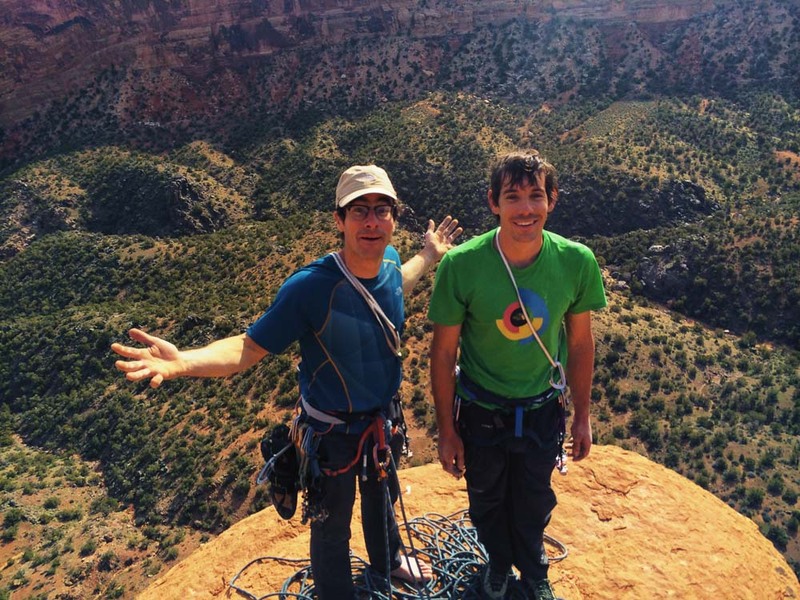 Moreover, Alex’s Honnold Foundation is working to better the lives of the Navajo people. At the time of the showing, Honnold had donated more than $150,000 of his own money towards the foundation. Together, Cedar and Alex are spreading the word about the foundation and its mission. The film highlights the epic beauty and harsh realities of the reservation. The Navajo Nation is stricken with poverty and crime, lacking the infrastructure for many to have running water, electricity or telephones. Sufferfest 2 is among other things, their attempt to make a difference. Our interview with Alex and Cedar follows. 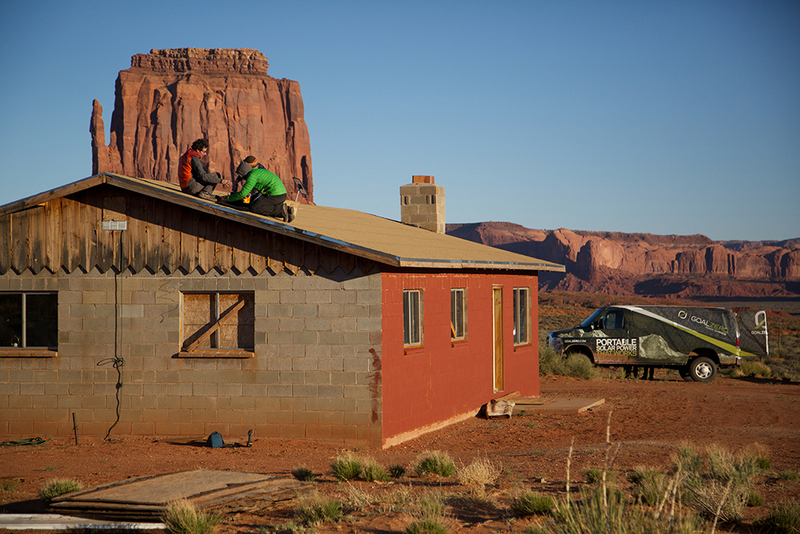 The Honnold Foundation has taken on an ambitious project to help the Navajo Nation. Tell us more about the culture you experienced there and how your foundation is working towards change. My foundation is enabling the work of Elephant Energy, a nonprofit based out of Denver that did the same kind of project in a different part of the Navajo Nation last year. I think the most shocking thing to me personally was that there are still such pockets of need in this country. Hopefully we’re doing a small part in reducing that need. Recently, you were dropped by Clif Bar. Amid a firestorm of public opinion, your response was controlled and professional. Do you think that Clif regrets their decision? Are you worried that other sponsors might follow suit? I doubt Clif regrets the decision, I’m sure they thought it through fairly well. I also doubt that anyone else is going to follow suit, though time will tell. But even if most sponsors shifted away from risk taking, there would always be someone left who’s willing to embrace the risk. Someone is always attracted to the edge. What pushes you to climb harder and bolder? I push myself. Because I want to do things that inspire me. I want to feel badass. And that requires pushing myself. I don’t know if anything set me apart. I think the main thing is just that not many people are doing this kind of soloing right now. It’s not that I’m doing anything that special, it’s just that no one else is playing the game right now. When I watch downhill mountain biking it always looks really scary, though most extreme sports are like that to me. Since I could never do them, they seem really scary, but I suppose to someone who lives on a mountain bike, doing a big back flip over a cliff is not a huge deal. Sure looks crazy though. Outdoor adventurers often have a Plan B. You don’t really have that option when you are soloing. Or do you? Do you ever think about Plan B before you start a climb? Plan B is downclimbing, and I’ve used it quite a bit. Sometimes Plan B is hiking up, looking at the wall, and hiking back to the car. There are tons of routes that I’ve gone out to do and wound up not trying or bailing from really low. That’s all part of it. And a few times I’ve gone halfway up something and then realized that I could traverse off and not finish it. You look like a pro-cycler in some scenes in the movie. How do you compare the rewards of cycling 100+ miles per day vs climbing a 5.12? Is there a Tour-de-France in your future? I’m never going to be a real endurance athlete. I’m not much of a cyclist or runner and I find the cardio sports pretty hard, but I love long days of climbing. I’d much rather climb 30 pitches of 5.12 than ride a century. What is your greatest achievement outside of climbing? Why? I have no idea. Graduating high school? I don’t have a whole lot of other achievements. Ask again in five years. I think I’ll have a lot more to say. Hopefully in the same place I am now. Climbing a lot, seeing the world, having good adventures. Maybe with a family. Maybe with a home. Certainly doing more work through the Foundation. We’ll see. Cedar, what was the preparation like for this trip? Did you plan all of the routes in advance? At your ability, do you tend to just show up to a climb and wing it? We had a loose plan to climb a bunch of towers via their most difficult routes, but neither Alex nor I are big on planning so a lot of the logistics unfolded on our iPhones. At one point we got lost and ended up riding 15 miles of mountain bike trail, and a few times we had no idea where the route was on the tower we wanted to climb! It kept things adventurous. The Mithril Dihedral footage you shot from Sufferfest 1 was incredible. How did you get such clean shots without any protection? Would you mind sharing what camera you shoot with while climbing? The footage on Mithril was shot one-handed while I hung from the cliff with the other hand. I don’t think many people have filmed ropeless like this. I carried a Sony RX100, which shoots incredible footage and fits in your pocket. Video technology has progressed so far so fast that this style of light and fast filmmaking wouldn’t have been possible ten years ago. You guys had to be eating tons during the trip. Any highlight recipes or concoctions we should know about? The eggadilla is the bomb. Heat a frying pan, crack two eggs, break the yolks, put a tortilla on it. The egg cooks and sticks to the tortilla. You flip the whole melded concoction over and add cheese, fold it in half and you have an eggadilla! No cleanup and it’s delicious! On a Sufferfest you can eat ten of them. Your films have elicited gasps from viewers around the world; how do you keep calm while filming a friend solo climbing something that might be outside of your own comfort level? Are you more nervous filming Alex climb solo, then when you solo yourself? No, I’m not nervous! I completely trust Alex’s judgment and I really enjoy documenting historic and compelling climbs. We actually laugh it up during these shoots and it’s all very chill, even if it gives people the chills when they watch it! You mentioned a Sufferfest 3 and I think the word kayak came up recently? Yes, we’ve talked about sea kayaking and pack rafting is another possibility. The one thing lacking from the first two Sufferfests was the potential for drowning. What was the wildest place you guys slept? In the original Sufferfest, we slept in a cow pasture. I covered a dried up cowpatty with my tarp and used it for a pillow. On Sufferfest 2 Alex slept under a parked car instead of setting up a tent when it rained one night. The Navajo Reservation in New Mexico is a like a different country. Do you think living on a Navajo reservation in this country is comparable to living in a third-world country? The Navajo nation struggles with poverty and the county that encapsulates this region is one of the poorest in our country. There are more than 18,000 living without electricity, which is pretty hard to imagine in our modern age. Living in the extremely privileged city of Boulder, the reservation is a stark contrast. Hopefully our solar project pushes the needle ever so slightly in a positive direction. The NYSkiBlog endorses Sufferfest2, which is available on-demand. The profits of the film are to be donated to Alex Honnold’s Navajo solar project.